Spider-Man: Homecoming is one of the most irregular films in the MCU (Marvel Cinematic Universe) officially speaking. Spider-Man is now part of the MCU, but is still owned by Sony and not Marvel Studios who has produced all other films in the universe. Sony has divulged that they plan on having five total Spider-Man films, as well as a Venom spin-off starring Tom Hardy and being directed by Zombieland filmmaker, Ruben Fleischer. No one other than Kevin Fiege is certain whether these films will be part of their own “Spidey-Verse” or continue in the MCU, only time will tell. As fascinating as it is to theorize about all these future endeavors, this review is about Spider-Man: Homecoming and if by the end of it you were only able to retain one fragment of information, let it be this: Spider-Man: Homecoming is the greatest first film for any hero in the cinematic universe, and barring Captain America: Civil War, is the finest film in the MCU. There’s nothing in the film that falls flat; as far as Summer blockbusters go, this film is quite literally, by definition, flawless. 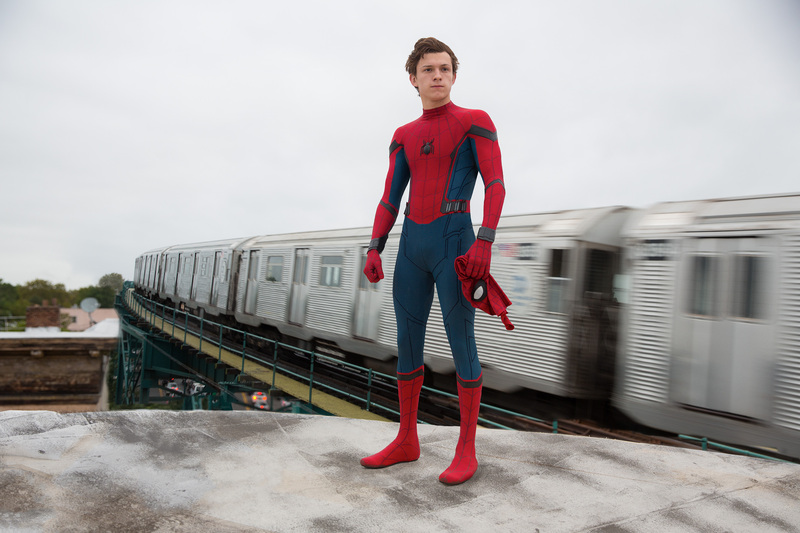 Spider-Man: Homecoming’s logline on IMDb is as follows, “Several months after the events of Captain America: Civil War, Peter Parker, with the help of his mentor Tony Stark, tries to balance his life as an ordinary high school student in Queens, New York City while fighting crime as his superhero alter ego Spider-Man as a new threat, the Vulture, emerges.” The film stars Tom Holland as the title character and has Robert Downey Jr. reprising his infamous character: Tony Stark. Downey and Holland’s co-stars include Marisa Tomei, Jon Favreau, Donald Glover, Jacob Batalon, and Michael Keaton as Vulture. As of late, you’ve undoubtedly been seeing commercials and hearing critics saying, “Tom Holland is the best Spider-Man, ever”; I’m prepared to one-up that and say Tom Holland brings his hero to life better than any other actor in the series (yes, that includes Robert Downey Jr.). No one ever asked for the smooth talking or developed Spider-Man that we’ve gotten in the past; we wanted a bumbling and awkward 15-year-old who is going through teenage difficulties while doing his best to live his peculiar life as a superhero. Watching Peter Parker argue with Ironman concerning how he is tired of being treated like a child is something every person can relate to and is done with the accuracy and delicacy from the actor needed to feel genuine. The opening of the film is something I never would have predicted a tactic to start a superhero film could be: a scene asking us to empathize with the to-be villain. Michael Keaton is the harshest villain to face-off against an Avenger, because he gives us a sincere motive. It’s not revenge (Zemo in Captain America: Civil War), greed (Stane in Ironman), jealousy (Loki in The Avengers), nor power (Ronan in Guardians of the Galaxy) that drives him, it’s love. Protecting one’s family is something virtually every audience member can be compassionate about and asking us to root against him throughout yet also understand his justifications is a unique decision that shows the film’s distinctiveness. Of course I want good to triumph over evil, but not since The Joker in The Dark Knight have I had such a hard time rooting against an antagonist. The MCU is plainly a new organism in the industry of studio pictures and one that allots for new techniques when it comes to threading films. Bringing in Ironman, constant Captain America cameos, callbacks to all three Avengers films (Civil War = Avengers 2.5), and jokes about Thor’s unpronounceable names for his accessories is a tool a film like this is able to use that most others cannot. The appearances, apart from being able to produce quality jokes and makes everyone feel like a “marvel-fan-boy/girl”, gives us a sense of familiarity. When I see Cap on the screen, even for a moment (like he did in Thor: The Dark World), it’s like seeing an old friend I haven’t seen in years and always is able to bring a smile to my face. Who knows how the MCU will continue to operate after Phase 3 comes to a close, but while it’s in its prime, let’s all enjoy it. There’s a total of four action sequences, all are stimulating and complex in their own way, but still feel grounded. Without the whole world being threatened, as is with practically every other super-human film, the ultimate conflict is more conservative and at times intramural. Physically, Vulture is a worthy adversary and his “ends to a means” style of crime makes all the combat much deeper than most has been in the past. The jokes are abundant and most hit, but the drama of the film is something I’m worried will be overlooked. Tony and Peter’s encounter is as intense a dialogue-driven scene you’ll see in the MCU and Peter struggling to climb out of a catastrophe while violently yelling at himself is an internal battle we don’t often see in such a testosterone-fueled movie. Those old-time scales, that weigh two things at once and lower whichever is heavier gives us a good analogy for how to make a faultless blockbuster. Witty humour, convincing drama, enthralling action, relentless tie-ins, unblemished performances, and a studio that knows what it’s audience wants is the recipe to a worthwhile film; no one ingredient more than the other. We hate giving too many films stellar reviews, especially back to back, but when it’s warranted, it’s warranted. Spider-Man: Homecoming may not be The Shawshank Redemption or The Godfather level of seamless, but in an era where superhero films flood screens and are the main source of revenue for most major studios, it’s damn near perfect. Hey! Someone in my Facebook group shared this site with us so I came to take a look. I’m definitely enjoying the information. I’m book-marking and will be tweeting this to my followers! Wonderful blog and amazing design and style.